It was a quiet row of shops with colourful wooden window panes, wide road with parking spaces on both sides of the road. It felt like a back alley, as if I was standing on one of the streets in Melaka; but without open sewage and it was very tidy. This was Singapore. I was heading to my destination on Amoy Street to meet a few friends. I wasn't told the type of establishment this was but if it was named after some bartending tools1, it wouldn't be a restaurant, despite the meeting was set at a dinner time. Walking on the opposite side of the street from the shop lots, I was trying to look for Jigger & Pony’s sign board. I nearly missed it as there was no flashing neon light sign boards like the other establishments on that street. It was a glass door under a dim yellow light, written “101”, that was the number of the unit. I had to look through the glass door to see the name of the bar. The bright light from the bar and the thought of having a cocktail there was appealing, I went in. Passing by a long table with 12 chairs on the left of the room, I looked at the paintings hung on both sides of the wall, simple but artistic. On my right was a lined up of private corners with comfy cushions. I walked straight to the bar as my craving for a cocktail increased intensely when I saw the shelves filled with different spirits. I was greeted by the Head Bartender himself – Anthony Zhong. Whilst I sat down, he asked how my day was and gave me a glass of cold water. That was exactly what I needed after the walk from the MRT station. He then started to make my drink while I asked about his background. Anthony had been to Japan and worked at the bars there for the past 2 years, I sensed the Japanese vibe around him. He’s got a pony tail and moustache, if I didn't know that his surname was Zhong, I would have thought that he's a Japanese. My drink came, I took a sip and started to feel like having a snack. Siti – the Assistant Manager offered me two menus. She said, “No happy hours here, just these.” They were the aperitif cocktails and pairings that run from 6 – 8 pm daily, to replace the usual happy hour. One of the cards said “Aperitivo Cocktails” and the other “Bites”. Shame I missed the promotion hours, the pairings could be a fun dinner starter. There was not going to be any food served here and I thought, the stay was going to be a short one. Then Guoyi, the owner of the bar put a basket of crisps in front of me. That was very thoughtful, they could read my mind here! I was then joined by my friends, tried a few whiskies and a bit of catching up on each others life before I rushed off to the train station. We also had a chat with Guoyi, a young and energetic lady with full of passion which was shown on the work of the bar, the design of menu and the professionalism in staff she has recruited. Jigger & Pony was barely a month old. It was a cozy place for good selections of cocktails and whiskies. My friends and I agreed to visit this place again in a few months’ time. We hoped to see it grow, and obviously to bring the inspiration back to Malaysia, where more quality bars are sprouting at corners of Klang Valley and Penang despite the price war among common joints and franchises. 1. Jigger is a tool used to measure alcoholic beverage ingredients. In Canada, 1 jigger is equivalent to 44ml (1.5 oz) and is usually called 'a shot'. 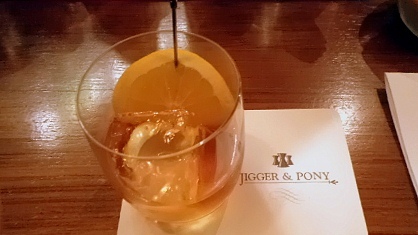 Pony is the smaller measurement of jigger that is 28.41ml (1 oz) and can be called 'a pony shot' or 'short shot'. Measurements of jigger are different around the world.